The diagnostic radiology residency program consists of four years of training after the PGY-1 level. Medical students will be accepted as applicants through the National Residency Matching Program. 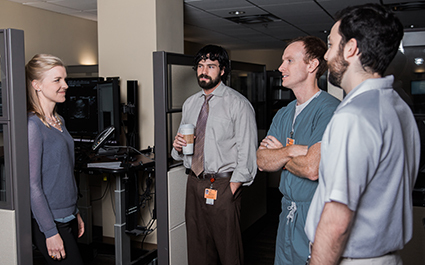 Applicants may wish to apply for the University of Tennessee Graduate School of Medicine's transitional year program, which has dedicated four TY positions for accepted radiology residents interested in completing all five years of residency training at the UTGSM Knoxville campus. One resident position will eventually be dedicated to a planned six-year Interventional Radiology Residency, which will include a surgical intern year at the UTGSM in partnership with the Department of Surgery. The residency program is structured to introduce each subdivision of radiology, with specific rotations in services dedicated to body, chest, musculoskeletal, and neuro-imaging, nuclear medicine, fluoroscopy, mammography, emergency medicine and interventional radiology, along with pediatric rotations at Vanderbilt University Medical Center, in partnership with the Monroe Carell Jr. Children's Hospital in Nashville. A dedicated radiology physics course provides first year residents with the necessary physics foundation required of all radiologists, with topics specifically designed to prepare residents for the American Board of Radiology Core Exam. Basic understanding of individual techniques is emphasized, followed by hands-on experience designed to allow the resident increasingly greater responsibilities as the training program progresses. In the first year (PGY-2), specific emphasis is placed on basic techniques, physics, and general diagnostic studies. During the second and third years, training in general radiology will continue with additional emphasis on advanced imaging techniques. Residents gain experience in positron emission tomography and cyclotron isotopes as part of their nuclear medicine rotations. In addition, all radiology residents attend the American Institute of Radiologic Pathology (AIRP) for pathology and radiology correlation during the third year. 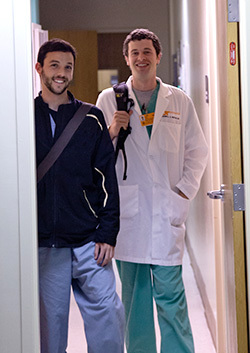 Elective rotations are provided during the third and fourth years, with emphasis on providing dedicated “mini-fellowship” rotations during the fourth year. The majority of each resident's call duties are completed during the second and third years. A night float system is in place for overnight ER coverage, and there is 24-hour in-house attending coverage at all times. Interventional Radiology home-call coverage is split between the resident on the IR rotation each month, with the remaining evenly divided among each residency class. There is close interaction with residents in other clinical departments. Under staff guidance, the resident will represent the department in interdepartmental conferences and will learn methods of efficient, cost-effective medical care; the rapidly changing scope of medical information; and the radiologist's role in medical management. At intra- and inter-departmental conferences, the resident will be challenged to develop a confident, consultant attitude. Training in pediatric radiology occurs throughout the four years and is particularly enhanced by two months of training at Monroe Carell Jr. Children's Hospital at Vanderbilt University Medical Center. The pediatric radiology program there is particularly strong and boasts distinguished, nationally-known pediatric radiologists. The medical programs at this institution have international reputations and produce excellent learning environments. Training in pediatric radiology continues at UTGSM throughout the entire residency. Throughout the four years, the residents are encouraged to explore research and scholarly activities to supplement the radiology experience. Residents will receive instruction in research methodology and are given incentive to produce and present productive, peer-reviewed scientific work. UTGSM supports resident travel to approved regional or national conferences in the amount of $2,250 per meeting when the resident is presenting an accepted poster, abstract or oral presentation or receiving an award. University Health System Incorporated partners with the University of Tennessee Graduate School of Medicine to create The University of Tennessee Medical Center. Approximately 250,000 exams are performed each year with a regional population base approaching 1.5 million. The University of Tennessee Medical Center is a regional tertiary referral academic medical center with busy trauma, surgical, oncologic, medical, pediatric and obstetrical services. The UTGSM radiology residency program boasts a 100% pass-rate for the American Board of Radiology Core Exam. Graduating residents have continued on to prestigious fellowship programs or moved directly into private practice.